Using our recommended products, we instruct our clients (generally speaking) to “shock” their pools every other week using a quality powdered shock like Bio Guard “Burn Out” or Arch “Turbo”. 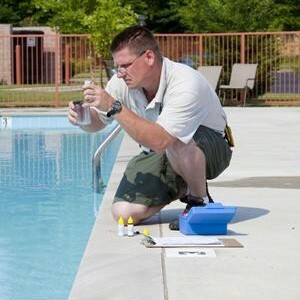 We keep a residual level of chlorine in the pool (using tabs, pucks or sticks) for sanitizing purposes, but due to a build-up of chloramines in the water, “shocking” the pool regularly will help eliminate the chlorine “odor”, burning eyes, and bather discomfort (not the only thing that causes these issues but one of the biggest contributors). However, as summer progresses and we start to experience the heat waves and high humidity, it is important to consider weekly additions of shock. Lately here in the Northeast we have had both extreme heat (we had our first official heat wave at the end of May) and extreme rain (several inches in the last week). With these weather changes we see beautiful, “Windex-like” pools, go cloudy or green overnight. In an effort to eliminate such water quality issues, we should all consider doubling up on our shock treatments when the conditions require it. 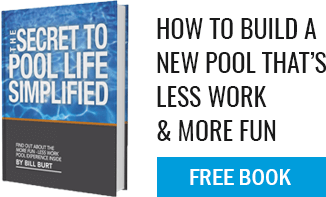 As the weather changes, so should the way we chemically treat our pools change. Pay attention to filter cycles as well. If you run your filter for 12 hours a day, consider adding a second run-time in the middle of the 12 hour “down time” so that there is not a 12 hour period of stagnant, non-filtering water (I always try to break up that long period of non-filtering with a 1 hour high speed filter cycle – just to discourage algae blooms). Again, use quality products (not all chlorine products are the same and sometimes you DO get what you pay for). And follow the directions in terms of how much product to use. “Half measures do us nothing” and once you have algae or other water quality issues, it is more expensive, difficult and time-consuming to solve the problem as compared to never having such a problem occur at all.